My last blogpost expressed my frustration at the lack of polish in the students’ presentation of their competition proposals. While I was away from the studio last Monday judging the Stevens Competition, my little kiln was busy firing my own glass samples for a competition. 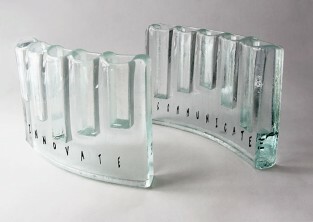 The theme of the competition was Innovate | Communicate and entrants were asked to make a pair of favours for a Banquet at Mansion House (see all the competition entries here). 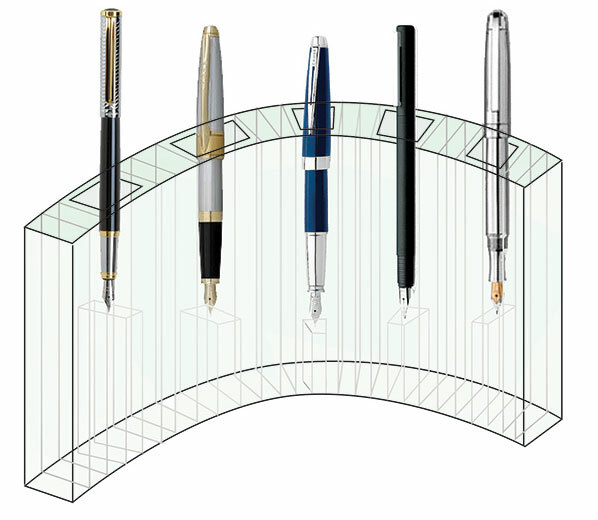 I had considered the theme and I wanted to make something which could be kept on a desk – the place where most designers, thinkers, writers and business people communicate and innovate – so I designed a cast and slumped matching pair of curving glass pieces which were to function as contemporary desk holders for pens. 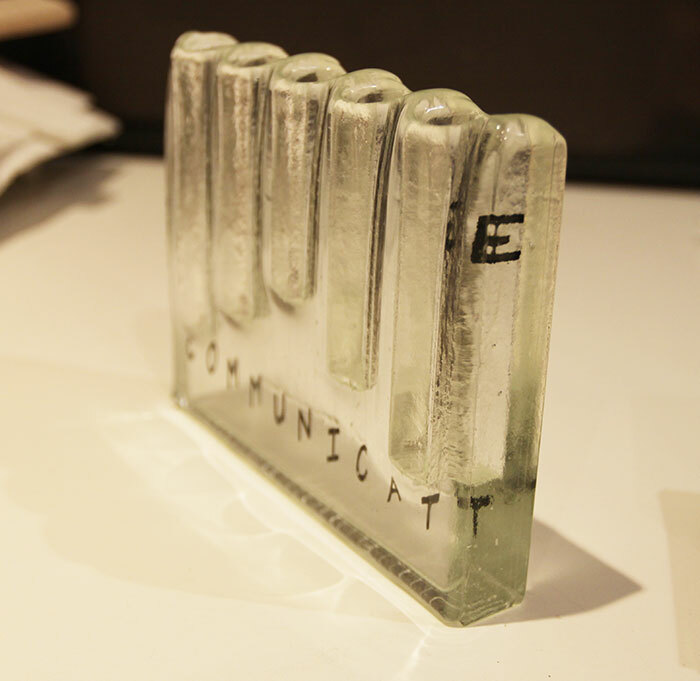 The words “Innovate” and “Communicate” were printed within each respective pen holder. I had spent a long time making little samples trying to work out the correct sizing to fit even the biggest fountain pen and I finally made a finished version which looked good and felt stable. However when I went to package it in my signature giftbox, I realised I’d miscalculated something as it was still slightly too big to sit comfortably in the box. I was running out of time before the deadline – cast pieces always take forever in the kiln – and my brain went into overdrive to come up with clever ways to support the glass in the giftbox at an angle which just allowed it to fit. Then a wonderful email arrived in my inbox from the organiser of the competition saying that she was extending the deadline by a week. What a lovely surprise! I had plenty of time to make another pair at the perfect – slightly smaller – size. With the luxury of time on my side, I could even tweak and perfect the making technique. So when I chatted to John Reyntiens on Monday – one of my fellow judges who also happened to be entering the competition – I was confident of easily making the extended deadline of Friday. And yet, later that week when I opened up the kiln to inspect my perfected pieces, my heart dropped through the floor and the cursing that was to be heard would have made any West Dulwich resident blush….. I had made a stupid, stupid error! The bitter irony was not lost on me that while I was being all sanctimonious about the students not paying enough attention to detail, I had not noticed the most basic of errors in my own work… the word ‘Communicate’ looked like the “e” was making a bid for freedom!! Stupidly I had put the “e” in upside down so it appeared at the top of the piece, not the bottom. How had I not spotted this before it went in the kiln?! After the swearing had subsided, I reflected that this was probably karma biting me back for being so unforgiving when judging the student work. I did not have time to make another one. Last week, the first version looked perfectly acceptable, albeit too big for the packaging, but now, having been offered the extended deadline, I had come to view the older version with disdain, knowing that I had time to make a truly perfect version. And yet my new version now looked ridiculous! Should I submit it anyway, allowing people to think the jumping “e” was intentional? Should I submit it in its perfect giftbox with a shameful note of explanation? Or should I settle for the old version, which now looked so clumsy to my perfectionist’s eye, sitting awkwardly in its box? As I went to bed that night I thought about my experience as a judge on Monday and I realised, with a leap of perception, that I am actually far more critical and less forgiving of my own work than I am when looking at other people’s work. 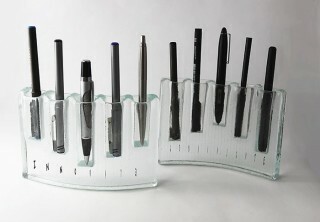 I reminded myself that although I was complaining about the students’ scrappiness in the written presentation of their ideas, I was very much more generous and open-minded when looking at their actual glasswork. I slept on my decision. The next morning I awoke with a compromise solution. To my eye the original set of samples would now never seem perfect, but to anyone else’s eye they would be fine. And the packaging problem? I did the unthinkable, and abandonned the idea of using my giftbox altogether…. for someone like me who produces fairly commercial products this was a bit horrifying as it meant losing my branding. 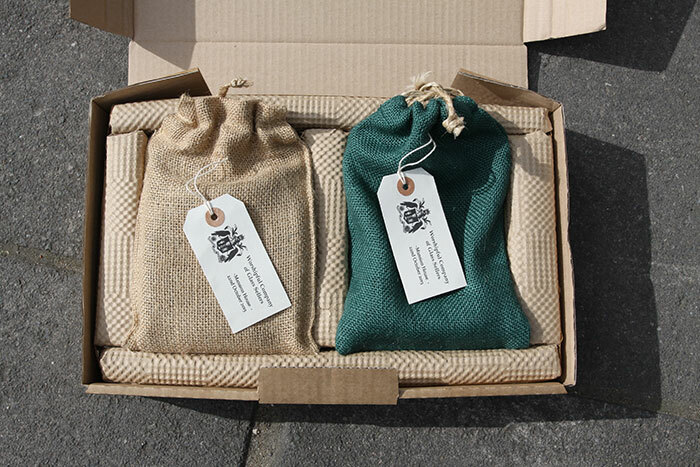 But within an hour I had googled a great company who make drawstring pouches out of jute, and suddenly I had a solution, albeit a very longwinded one as it involved me driving to the other side of London and then a long detour back via Art Logistics in west London to drop off the finished pieces. All that driving gave me time to reflect that the extended deadline had been a gift, but it had also resulted in me being subject to the curse of my own perfectionism. One day I will achieve it, but for now I can but dream of the day when I can think my way to an acceptable compromise without needing the pressure of a deadline!